LOL! I don't know why that title popped in my head but it did. I went a little punch crazy making these tags. Last week, my friend Dawne dropped off some coupons for Ben Franklin Crafts 40% off sale and I ended up buying some Martha punches. The big snowflake is a Marvy punch and the little one is a Martha. I glittered both of them and added blingy brads. See that star border, I don't know why I bought it but it turned out really cool. Overall, I got to use up a lot of scraps. Here's a Christmasy card that I made several weeks ago. I had stamped and colored that owl awhile ago but never used it. And I wanted to make something out of the new curvy rectangles from Spellbinders, so I ended up with this. 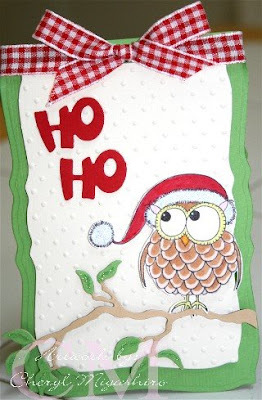 I saw this on Jen M's blog and wanted to make one using the Hero Arts holly flourish background stamp. 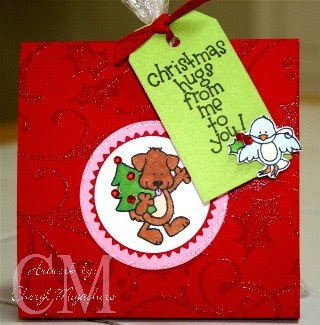 If you look closely, I embossed the holly flourish with clear embossing powder. And of course, I had to use some Dandelion stamps to finsh it. The tag is a Spellbinders shapeabilities tag which I got from the store. Well, I'll be back later with some other cards that I made. Thanks for stopping by! 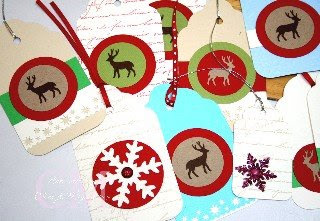 love the tags...everyone is using that martha stewart snowflake punches...I gotta have it now!!! thanks for sharing this...I love how you glittered/embossed the background...I seem to forget the basics when it comes to making things. too cute! They're all so very nice =) I really like your title too. It's real funny!! Caught my eye...hehehehe. Cute projects, Cheryl! 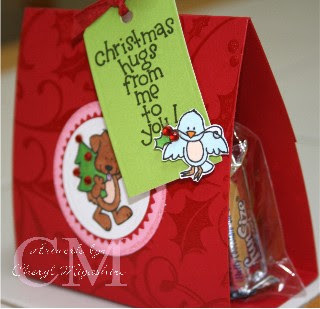 Really liked the cute candy favor. The embossed background came out really nice! Love those snowflake punches, too. Did you know MS has three different ones? I picked up them up from Wal-Mart and Ben Franklin. cute cute projects!!! i really love the favor with the Dandelion Design puppy!!! I can't temember his name right now, but he's a cutie!